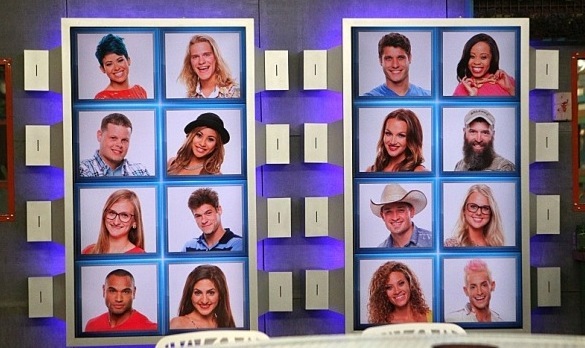 The results on Big Brother 16 are in and the first HouseGuest of the season has walked back out through those doors of the BIg Brother 2014 house, so who went home on Big Brother 2014 tonight? Find out those Week 1 results on Big Brother 2014 tonight below in our Big Brother 2014 spoilers! Was anyone else out there excited to see this live eviction show tonight? Just me? Oh well, as I was excited to see the HGs interact with Big Brother host Julie Chen and see how they would vote once they got into the room! Did it go as planned or did we see a shocking elimination on Big Brother 2014? Get the full details over in our Live Recap, otherwise scroll down for the voting results! The HouseGuest that was evicted tonight on Big Brother 2014 is Joey Van Pelt!!! It was not even close, as it was a 13-0 vote and Joey was sent packing. She had some crazy antics during the week and it was bound to happen, but your results are official and we see some tears in the Big Brother 2014 house! OMG…. The mental picture…. You’re just a hoot! I know Lilly!! It hurts like h*ll ,doesn’t it. Yes ma’am. I have hope that Amber is smarter than Devin, though…. Just praying she (and some others) grow some courage! It will probably depend on if they can persuade Caleb to let go of Devin. Amber IS smarter than Devin!!!! I do the others find the courage to put both Caleb and Devin on the block…and soon. I forgot to mention Brittney! Devin has said he will target her because he doesn’t like her and thinks she is a floater. That would be good! Brittany could help win the BOTB! Well, and he may seal his fate. Wouldn’t it be something if he gets so bullying as HOH that the rest of the house throws the BOTB in order to back door Devin! That would be so sweeeet! That’s why Amber needs to nominate Paola first! But would she even have the guts to stand up against him that much? Crossing all fingers, toes, arms, and legs…. Reeally uncomfortable…! did you delete my post ? I commented on the eviction and it disappeared. Did you say a naughty word, Mrk? Because I had a comment moderated, and I swear the only “bad” word in it was c r * p.
Watching the feeds… Amber said she will not nominate two girls. And will definitely NOT nominate Donny and Paola,because they are her two best friends in the house. I’m liking her a lot too Cat. i totally agree! i’m trying to think of anyone that woukd be opposed to that plan, but I’m not coming up with anyone…at least noy enough people to make a diffrence in the vote. We should learn who the noms are sometime tomorrow. Glued to my laptop tomorrow (between watching the Walking Dead marathon). I’m sure Todd will let us know asap! Who are the nominations made by Sir Idiot Devin and the stalking victim Amber? If Amber’s team wins BotB, her noms come down & she’s solo HOH. If anyone but Caleb or Devin wins POV, Devin goes up on the block as the backdoor renom & out he goes. There’s a few “ifs” in there, I know, but anything can happen in the BB house! I think that if Ambers noms wins BotB they come down and she is no longer HOH. Devin becomes the solo HOH. i guess i know when i am being pushed out. everthing i write now is moderated. if they want me to stop posting SAY SO! I’ve been having a few problems too. So has Carol. And Lilly too. We’ve all been moderated because of some innocuous word. It’s not Todds doing. There are obviously some glitches with the system. Why not tell us what we did wrong? More than willing to comply, but comply with what? I think the system is predesigned to pick up on words. I don’t know if Todd himself can realign it or if it has to be done by someone else. He could look into it for us i’m sure. You did nothing wrong. This system is new for us (and probably him). Lets be patient my dear. You know, mrk, maybe it’s too many hard returns? That’s the only thing I can think of. Todd, hopefully you can figure out what we’re doing. There is a separate section for moderation on this new system and I did not know it. There were 11 pending in there, so I approved them. Not sure if you have more that weren’t posted. I’ll check out the settings and see what is going on! OMG, the nom ceremony happened last night. Devin got to choose first (they did the egg thing again). He put up Brittney and Pow Pow. Amber chose Hayden and Nicole. Ok, i just noticed Todd didn’t do this blog. Todd i hope all is well and you are just busy moving.